An Iranian analyst says Russia is likely to stab Iran in the back in order to secure its own national interests. Russian President Vladimir Putin and Saudi Crown Prince Mohammed bin Salman’s exchanging pleasantries at the inaugural of the G-20 meeting is front-page news these days. At a time when Saudi Arabia is more isolated than ever both on the international arena and by people, Putin’s welcoming bin Salman has become so controversial. 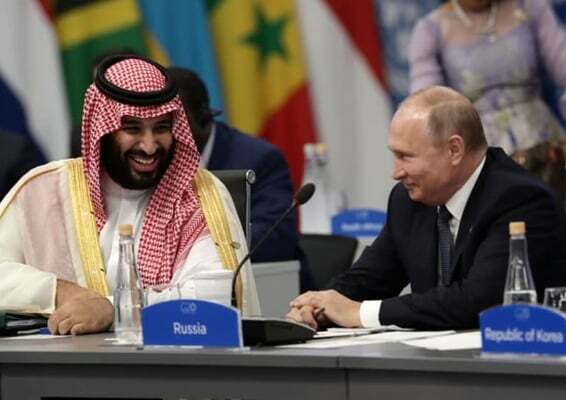 Some analysts believe the adoption of such a soft approach vis-à-vis Riyadh by Putin is due to Saudi Arabia and Russia’s common interests with regards to oil and the Organization of the Petroleum Exporting Countries (OPEC). National interests! We have not drawn a line between national interests and other concepts such as attachment, intervention, responsibility, etc. If Russia do us a kind favour, we regard it as Moscow’s attachment to Iran and forget that relations between countries are different from relationships between people. And maybe we disregard the fact that our interests and those of Russia are strategically intertwined! In recent years, Russia has put itself at the centre of negotiations, entering into talks with all regional powers. What has been important to the Kremlin is its pragmatic interests, which have surfaced sometimes during deep strategic cooperation with Israel, sometimes during the course of cooperation with Riyadh, and sometimes in tactical cooperation with Iran! Therefore, the so-called friendly country’s temporary attachment to Iran has only been aimed at securing its own interests! If countries’ interests are strategically intertwined, they will not drop support for one another in times of crises. As a case in point, one may refer to US President Donald Trump’s unflinching support for bin Salman, regardless of the moral aspect of the move, when he had been marginalised by all countries over the murder of Saudi journalist Jamal Khashoggi. If Putin did not gain any benefits from his cooperation with Iran, such cooperation would not exist at all. But unfortunately, when we are embraced by Putin, we forget altogether that we should “Beware of Greeks bearing gifts!” It is clear that a superpower would never like to have a powerful country as its neighbour, especially one that can play a pivotal role in regional equations. Accordingly, dropping support for Iran in Syria, the drop in oil prices – despite Washington’s severe oil sanctions – in cooperation with Russia and Saudi Arabia, to name just a few, indicate that Moscow is unilaterally seeking its own interests, and such behaviour toward Iran is not without precedent. Both countries’ histories are marked by stories of Russia’s abuse. When we read about the ignominious Turkmenchay and Golestan treaties in our history lessons, we go red with rage and bite our lips. It was due to this hidden anger that we chanted the slogan “Neither East, Nor West” during the 1979 Islamic Revolution. But it seems that we have fallen for the East out of grudge against the West! So, it is necessary to know that Russia will stab us in the back if such a move serves its interests. A country that drops support for its ally in critical times, or victimise it for the sake of its own dealings with major powers, is notorious for backstabbing. Russia seeks its own national interests and definitely does not compromise its interests for the sake of Iran. The main objective of all countries in the domain of foreign policy and domestic issues is to secure their national interests. No country has permanent friends or foes. It is “national interests” that has the final say.